There are 10 new Grocery offers from SavingStar available from today. 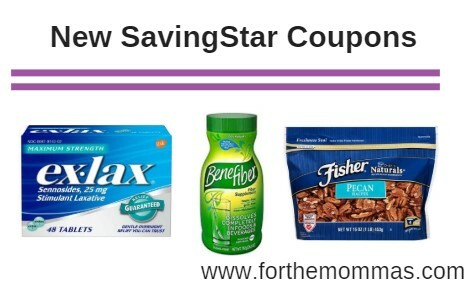 You can save up to $14.75 on Gas-X, Robitussin, Tums, Dimetapp, Citrucel, Benefiber and more with the newest SavingStar offers. SAVE $1.00 on any ONE (1) Gas-X® 18 ct. or larger.Expires 3/31/2019.Save $1.00. SAVE $1.00 on any ONE (1) Ex-Lax® or Perdiem® product.Expires 3/31/2019.Save $1.00. SAVE $2.00 on any ONE (1) Dimetapp®.Expires 3/24/2019.Save $2.00. SAVE $2.00 on any ONE (1) Adult Robitussin®.Expires 3/24/2019.Save $2.00. SAVE $0.75 on any ONE (1) TUMS® (28 ct. or larger).Expires 3/24/2019.Save $0.75. Save $1.00 on any TWO (2) Dial® Liquid Hand Soap Refills, Foaming Hand Wash or Dial Complete 2in1 Bars (3 Bars or Larger).Expires 3/24/2019.Save $1.00. SAVE $1.00 on any ONE (1) Dial® Tone Body Wash (12oz or larger) or Dial Complete 2in1 Bar Soap (6 Bars or Larger)..Expires 3/24/2019.Save $1.00. SAVE $2.00 on any ONE (1) Benefiber® product.Expires 4/6/2019.Save $2.00. SAVE $2.00 on any ONE (1) Citrucel product..Expires 4/6/2019.Save $2.00.